Harvesting Amaranth Grain…Was it worth it? Harvesting Amaranth grain for eating. The seed being so small, most people don’t want to spend the time to harvest it. I almost gave up before trying. However, I found that it isn’t so difficult on a home scale. I harvested grain from about 8-10 plants and got about 2-1/3 cups. I eat about 1/4 to 1/3 cup at a time. Step 1: Set a colander into a larger bowl. Use amaranth that is dry and mature. Strip seed and fluff from amaranth stems in downward motion, stalk to tip. No problem if stems snap off into the colander. Let it go. Step 2. Massage with fingers, rub between hands, scrub along bottom of colander to separate the seed material from chaff and stalk. (Note: my hands get a little itchy with this process but it’s minor and I get used to it. You may want to do a test run to make sure no rashes or reaction…try gloves?) Seed and small chaff go through the colander holes. Gather larger leftover material in colander, and give a final rub and massage. When there is not much seed coming from of the material, discard. Discard smaller remains from colander when you feel you’ve done a fairly thorough job. You are wise if you don’t set out to get every last seed. Step 3. Pour seed and chaff from large bowl to a paper plate that has a pretty good sized lip. Shake slightly toward you and blow slightly away from you. Seed rolls toward you. The chaff blows over the edge…and on to your dog. This is my first try with video demonstration. The amount of amaranth I chose to use in the demo made it easy for recording. During the first step; I, usually, fill the colander up about three quarters of the way. Larger batches make things go more quickly but do what is most comfortable and successful for you. I cooked a 1/4 cup of amaranth. I usually put about three times the amount of water into it, bring to a boil, cover and simmer for 20 minutes. I found that fresh grain does not require the same amount of water…needed a bit less…maybe should have used only 1/2 cup of water or so. Amaranth that I get from the store is, probably, older and drier and takes in more water. 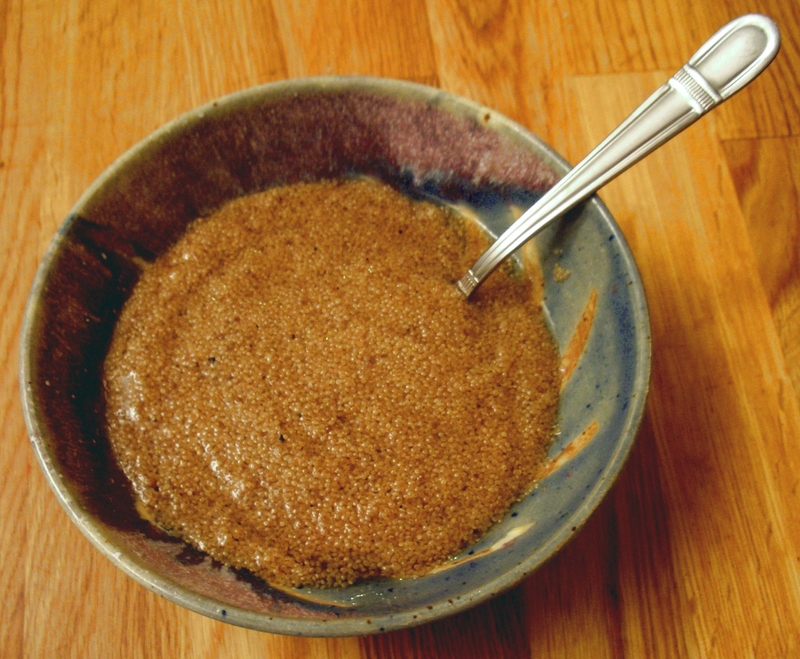 Store-bought amaranth can have a kind of gummy texture. Not so with this grain. It was light and had a wonderful texture and flavor. A bit darker in color. I wouldn’t doubt that there were bits of chaff in the mix as I didn’t work, terribly, hard at getting rid of every last bit. However, I never noticed the extra fiber while eating the grain. Was it worth it to harvest my own amaranth grain? Positively! This entry was posted in Edible Landscaping, Food, Organic gardening, Uncategorized and tagged Amaranth, Amaranth grain, harvesting amaranth. Bookmark the permalink. 29 Responses to Harvesting Amaranth Grain…Was it worth it? is there a way to buy amaranth grain directly from a farmer as soon as they harvest and get the grain removed? Good question! I have some thoughts. One of my top posts with regard to hits is the Amaranth post. Just last night, I was talking to a young man. His face lit up and he started to ask practical questions when I said that I grew amaranth. People seem to be interested in this food. The way I see this happening is to start talking to local farmers when you go to the farmers market. I do not know the economics when you look at this crop on a larger scale. But I do know that farmers would, first, need to get the message that they can sell the stuff. Let them know that you want it and would pay a fair price for it. The farmers that are growing locally grown grains or milling grains might be interested in such a project. Develop a relationship, become a member of a local CSA where you can have a voice and maybe even lend a hand. Personally, I’m considering asking neighbors if they would enjoy my growing a patch of amaranth in their yards so I can grow and harvest a little more next year. We’ll see. Today, I’m visiting a friend who runs a small CSA. This will be a great topic for conversation! Thanks! do you own a small grain dehuller that can work in the home? or where to find one that can dehull millet? So sorry for missing this message! does amaranth have a smell to it? i bought some amaranth that came in a package. it smells like that after rain smell or soil smell or perhaps might smell like nitrogen if that has a smell to it? i have noticed some packaged grain products having this smell. like i once bought flattened rice flakes and it also had that smell. i tried to air out the smell but it remained. i showed the packaged rice flakes to a relative of mine who grew upon a farm that made rice flakes fresh and he said it would never smell like that. I cannot vouch for the quality of the study but it does give credence to using your senses for quality evaluation. I wouldn’t, necessarily, follow this with the assumption that your product is unsafe or bad…I don’t know the answer to that. Anyway, good reminder to keep our eyes, ears, and NOSES open! in this link they say basement smell. do you recall after you harvested your amaranth fresh how it was smelling? i skimmed the article but couldn’t grasp all of it because it is so technical. but great article! totally relevant to what i was asking! it is says that if a grain is harvested and remains wet or moist, and not dried right away, bacteria, fungi ..field micro organisms begin to form. and these organisms produce the smell. now, micro organisms are everywhere, they are a part of life. however the smell they produce, sometimes a pleasant smell sometimes a bad smell, how does it affect our health? how safe is it to consume these things? it says sometimes the smell could be a sign of mold, but isn’t mold usually black, sooty, but i didn’t see that in my grain, could it be that mold is there i’m just not seeing it and so it could make me sick? and give the air that smell. we’re breathing those spores. maybe they are in the amaranth? but how safe is it to consume amaranth with this? sometimes microbes are good for us sometimes they are bad for us. I just harvested some amaranth this season(2013). I use a dehydrator to dry individual heads of Gold Giant. Then I put it into a bowl and kneed it with a pair of gloves until it is all broken up fine. then sift it through a screen sieve. the seeds go right through, most of the chaff does not. you will have to shake it round. Then you can gently blow the light chaff away from the seeds. There are some 70 varieties of Amaranth, some quite beautiful, others not so pretty but none are toxic. Pig Weed, the bane of many gardeners is also an Amaranth. I just “harvested” a large number of plants that were about 4 feet tall with lots of seeds. I am drying them in the attic as experiment. If it works and the seeds are just as good as the cultivars, I will grow a large patch of Pig Weed next year. Thanks for sharing your experience with amaranth! I’ve been amazed with how many people are interested in this topic. This year, I went back to growing Opopeo. It is red and beautiful and produces a white seed. Last year, I grew a gorgeous Hopi Red Amaranth but it produced a black seed that I did not enjoy eating. The black seed seemed grittier, a less pleasant texture to eat. Thank you for this! You made it look so easy and answered all my questions. Can’t wait to go harvest mine now. I would love to hear how the pigweed turned out because I have some growing on the property and after growing the amaranth I was surprised how similar they look. I was wondering if I could forage it! Opopeo amaranth is my favorite annual i think. Its such a beautiful plant, mine is rivaling reids dent corn in height this year. The sunflowers get embarrassed blooming slightly earlier and falling over a week later while the amaranth just shoots up and away to the sky until frost. The leaves are as healthy as spinach and the grains as nutritious as corn or soy (properly prepared!!). Add to that there were jerks who banned the plant at one time and amaranth becomes an obvious choice for anyone who plants a single seed a year. I feel very lied to. Everywhere said it isn’t too hard to harvest, but the seeds are so small and light they take forever to separate from the bugs let alone flower parts. The seed blows away nearly as easily as the flower parts, the orange and green parts of the flower. I try eating it but the green flower parts ruin the flavor. Bugs got to the leaves also. It is beautiful when flowering but impossible to get a clean harvest. Some things that I’m finding: Dry, dry, dry amaranth is much easier. This stuff has been hanging outside, under cover for near two months, I think. When it is very dry, I don’t even bother trying to pull the seeds off the stem but break off pieces that have seeds on them to fit into the colander to scrunch, lightly massage, and fluff. You can hear the seeds falling. Don’t get too crazy on it because you end up forcing a lot of chaff through for very little seed benefit. Listen. You will hear seeds fall and, then, not so much. Dump the remainder into a bucket. Continue. When I have a cup or two of stuff in the bowl, I dump it into the lid of my canning pot which is lightweight and a perfect size. It has a dip in the middle, so that the slightly heavier seeds tend to fall to the center. It does take practice to swirl and blow just right. Yes, some seed will blow off, but not most. I don’t think everyone could, comfortably, perform the task of manual blowing the chaff away. I do this by my driveway. Amaranth WILL grow where the seed, inevitably falls. After a bit of blowing; I mix it with my hand and give the lid a swirl. More chaff will come to the top for another bout of blowing. I have gotten so much better at this since I started this season, with a much cleaner and faster, result. However, YES, Bugs! I’m finding stinkbugs lurking, here and there. It’s terrible when you give one of those suckers a massage. I keep my eyes and nose open to detect them. Tiny spiders and such fend for themselves. Dust is an issue, also. This year, I’m going to freeze for 3 days to kill any insects and their eggs. After that, I will make sure that the seed is dry for longer term storage on the shelf. If necessary, I may gently dry in the dehydrator before sealing in a container. I have heard people report that their amaranth takes on a funny smell…I suspect that it is going bad or molding because of moisture. I find it necessary to wash/rinse the amaranth before cooking using a very fine strainer. This will help to remove dust and to spot any debris that you don’t want in the amaranth. I do not go for, perfectly, clean but do not want the flavor to be ruined. I find that I use a lot less water than recipes usually call for during the cooking process. I wish I could harvest some of the leaves for a bonus, but; like you, bugs (mostly, cucumber beetles) eat my leaves to lace. 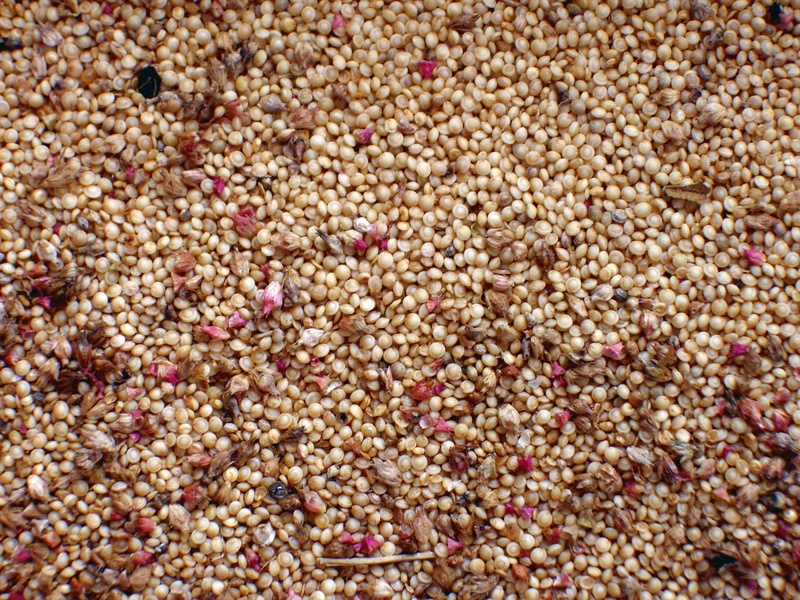 Different varieties of amaranth give different qualities of seed as well. Last year, I blew my whole harvest because I planted a lovely amaranth that produced a beautiful shiny black seed which I didn’t like to eat at all! Experience and practice make a huge difference. This process, clearly, takes a whole lot more time and physical energy than buying amaranth at the store. J was just wondering aloud to me if I use more calories to process than I get from eating the stuff. Hmmmm. For me, the effort is worth it for many benefits that I receive but it will, certainly, not be for everyone. I wish you the best! I have to agree with MicVee drying is essential. I used a screen over a large tub. Wearing clean gloves I rubbed sections gently over the screen and most of the seeds went into my tub. I still have bits of chaff after pouring from tub to tub in the wind but I figure they will rinse away when I clean it before cooking. I had previously harvested one plant and it was very dry. This one was my first attempt and super easy to separate, dusty business, but easy. The rest of the plants I thought were dry enough just being out in the garden but when I cut them and tried to rub them the flower bits were not dry enough and crumbled interfering with the seed falling through the screen. I suspect this is the same thing that happened to you Brenda. I cleaned out the kids swimming pool, separated the flower heads into smaller sections and let sit in the sun on the porch for a few weeks. This has worked pretty well for my small harvest of 7 plants. I will definitely do it again next year. I suspect a bunch will grow up just off the porch where I did the separating! I used old window screen that was hanging around. It was on the smaller side so it sat over the tub perfectly. Happy Halloween! Amaranth is a highly important food for people who are allergic to gluten as it is 100% gluten free. Amaranth is actually not a true cereal grain but a seed of an annual plant which related to spinach. The green part of amaranth is eaten as vegetable and the seeds are utilized as grains. The seeds of amaranth are a boon for those allergic to grains. I also have noticed an earthy smell to the amaranth grain I purchased. It’s also slightly reminiscent of celery…or apples. Maybe it’s just not the freshest package product. We have amaranth, and this spring I picked the leaves and cooked them like spinach or swisschard,we could not tell the difference,and now I want to harvest the seeds,so we will see,I thought I would mix with oatmeal or other hot cereals, always trying new things,in the winter I make a lot of muffins, so will use the seeds,or try to. I grew some and cleaned it inside,had a mess I add it to muffins which I make on a weekly basis,also add to hot cereals,will probably not do it again I’m 75 yrs old,it was fun to try.